Back in 2011, I wrote an article here on oneClimbs titled A Fresh Take on the Word of Wisdom. In an attempt to resolve some personal questions regarding the Word of Wisdom that had haunted me since my mission days, I spent six months studying, pondering and collecting the information that I presented. What resulted for me was a “fresh take” on the principle that provided me with answers and guidance. After publishing the article, I made some key changes in my life, perspective, and diet. I’ve been contemplating writing a new article as a follow up to detail some of these changes and what I have learned. I might have to postpone that particular article for a future date because recently I have made even more significant changes as a result of a great book that crossed my path. I have decided to review Discovering the Word of Wisdom because I believe that the author, Jane Birch, gets it. The book eloquently confirms my independent conclusions along with many more using sound reasoning, and many great references. The book is written by Jane Birch and advocates a whole food, plant-based diet (WFPB) and if you liked the movie Forks Over Knives then you’ll appreciate this book. You should understand that I was raised in Texas where Bar-B-Q is more than food, it is a tradition. Family gatherings, holidays, and get-togethers are heavily centered around eating meat and lots of it! We love our brisket, steaks, sausage, Bar-B-Q sauce and more! I’ve lived both sides and I’ve studied the issue in-depth. I’ve come to the conclusion that the “evils and designs which do and will exist in the hearts of conspiring men in the last days” have blinded a great many of us. Before you jump to conclusions or get all bent out of shape, please read the rest of my review with an open mind and let the Spirit guide you. If you don’t feel good about it, then stop reading, but if you feel that this is something you need to look into more, then keep reading. What about Dairy and Eggs? Why Doesn’t the Church Tell Us These Things? I read these chapters here on Jane’s website before I decided to do the review. I decided that I really wanted to see what she had to say in chapters 2, 4, 5, 7 and 9 in particular so I told her to send me a copy of the book and I’d check it out. The book follows Jane’s own journey to understanding the principle in her own life while presenting the information she discovered. Each chapter ends with a “Real Mormons, Real Stories” section where someone recounts a real-world experience that relates to the chapter. To be honest, while flipping through the book, I didn’t think I’d appreciate these personal accounts very much, but I read them anyway and found them to be very enlightening and a worthwhile addition to the book. The end of the book presents some ideas and practical suggestions about how you can begin to implement this lifestyle along with a nice selection of other resources that you can check out to learn more. I really appreciated Jane’s reasoning on why you should go 100% and not ease into this diet. She liked the change to overcoming addictions; cold turkey (no pun intended) is best. The author takes us back a few years to where her journey began. She was suffering from crippling leg pain and began praying and searching for answers. One day, she was watching a TV program where they were doing a segment called “The Last Heart Attack” where a diet that could eliminate heart disease was being discussed. Heart disease is the #1 killer in America (597,689 deaths per year) and you might be interested to know that it kills more than cancer on a yearly basis (574,743 deaths per year)! After doing some research, she realized that a whole food, plant-based diet, was key to avoiding many chronic illnesses and diseases so she decided to try it out. It was a challenge for her and she did not like it in the beginning, but the desire to attain better health and weight loss kept her going. She tried a number of recipes that all failed but kept on going until around seven to eight weeks later she realized that she was beginning to enjoy her food. It’s interesting how many poor decisions regarding food that we justify until we get sick. This topic is a tough one for many, especially because of our traditions and society in general. Like the author, I used to mock vegetarians and vegans because I was a carnivorous Texan! I used to crack up at the bumper sticker that said, “I love animals, they’re delicious”! This chapter was actually the first one I read and I have to give it a hearty “amen”! She does a beautiful job of addressing this subject and I was amazed at how closely her research matched my own; it’s nice to be validated by someone with a Ph.D! She points out that a careful reading of the Word of Wisdom reveals that animal flesh is indeed for our use but intended as a “backup source” of nutrition in times of scarcity. She states: “As animals eat plants, vital nutrients become part of their bodies. Therefore, in times of necessity, when we humans can’t get enough plants to sustain life (for example, in time of famine or excess cold when plants are scarce), we can eat animals as a backup source of nutrition.” (p.16) She mentions some of the nutritional downsides of consuming animal foods and concludes, “Perhaps this is one reason the Lord ordained them for our “use” under certain conditions, but not for the “constitution” or “nature” of our bodies” (D&C 89:10-13). She addresses the protein myth as well and makes a bold claim: “What most people do not know is that protein is so ubiquitous in plant foods that if you get a sufficient number of calories, it is almost impossible not to get enough protein, including all the essential amino acids” (p.17). There’s a section called “Should we never eat animals?” that I’m glad she included because this is a very polarizing subject with many on both sides who slide too far to the extremes. She gets this right as well by noting that animals are indeed for our use, but under the right conditions. Like me, she doesn’t call herself a “vegan” because her “focus is not just on avoiding animal foods” but “eating the food that are best for [her] body” (p.19). She says that she is “grateful now to refrain from eating meat when there is no need, knowing this is pleasing to the Lord” (p.19). But just like many other things, we abuse the creations of God because of our own lusts. This was a great chapter because it focused on the “dos” of the Word of Wisdom. She does a fantastic job of pointing out that the definition of “herbs” in Joseph Smith’s time, referred to plants in general, especially culinary plants. The last section I found a little surprising because it frowns upon refined plant oils. I use a lot of coconut and a little olive oil but, yeah, they are technically pure fat. She points out that we get enough fat from whole-plant foods and we don’t really need to be adding to our constitution additional high concentrations of these fats. Very true, so I tried sautéing some bell peppers with just water, adding more as needed, and they turned out fantastic! The virtues of grains are explored in this chapter including this part that I found insightful, “[Grains] can also be more easily stored away for use in times of cold or famine” (p.34). The great thing about grains is that their ability to last through the winter months makes it possible to avoid killing animals for food if we are able to prepare properly in advance. I really wanted to read this chapter because there’s a lot of fear out there about gluten and such. I’ve been a little conflicted because of things I have read about how bad modern wheat is. Now, I still believe a lot of the research out there that suggests that modern wheat is a poison compared to what it used to be, but the Word of Wisdom says that all grain is ordained to be the staff of life. If it’s so bad, then why didn’t the Lord warn us about it like other plants such as tobacco, tea and coffee? She doesn’t address the gluten issue here which I thought would have been pretty important to address considering that it is such a hot topic right now. That said, I believe that the principles she addresses are sufficient enough to help you make your own decision. As for me, I’m just going to try to find purer wheat; it’s certainly still out there. We still have many, many other healthy grain options to choose from as well. Chapter 5: What about Dairy and Eggs? This chapter begins with a great quote that made me laugh out loud, “Dairy and eggs are not specifically mentioned in the Word of Wisdom – neither are Twinkies or Junior Mints” (p.43). I’ve been eating an egg or two for breakfast every other day or so. I’ve ditched milk and yogurt from my diet but a very little cheese here and there along with some ice cream and milkshakes every now and then are indulged in. She prefaces this chapter by declaring, “I realize I am stepping outside the wording of the Word of Wisdom to form an opinion” (p.43), but since I welcomed her opinion, I read on. She called dairy and eggs “liquid meat” and suggests that, “meat, dairy and eggs are not the original source of any essential nutrients. Like meat, dairy and eggs can provide nutrients to the human body, but they are not superior to plants in providing these nutrients, especially in light of the drawbacks” (p.43-44). I don’t mean to be crude, but I’ve always wondered about how necessary it is to eat the product of another animal’s menstrual cycle (that’s what a chicken egg is). Next it is a little trip down the rabbit hole. Remember how the Word of Wisdom mentions the “evils and designs…of conspiring men” (D&C 89:4)? Here’s where we get to see some of that. In the US, the dairy industry is amazingly powerful and effective, especially at manipulating the truth. The only body that milk does good is the body of a baby calf! In dairy, you get really high concentrations of animal protein, especially in cheese. You’ll find in cheese the highest concentrations of caseomorphin which has an identical structure to morphin and, you guessed it, it’s very addictive! The dairy industry knows this, I’ve studied this myself and it is amazing how they know full well that cheese houses a high concentration of an addictive molecule and intentionally seeks to load everything from pizzas, hamburgers and more with “double cheese” this and “double cheese” that. When we get more cheese on something, we’re thinking, “Yay! They just made that more delicious for me!” while they are thinking, “That idiot is going to get hooked on this.” Dr. T. Collin Campbell goes so far as to claim that the protein in milk is, “The most relevant [closely connected] chemical carcinogen ever identified” (p.46). If all you know about milk is what you’ve heard in TV commercials, then you’re the victim of fantastic marketing. If you haven’t ever really looked into milk and dairy in general, do it now. This chapter begins by suggesting that the Word of Wisdom is the answer for protecting the top three causes of death in America, which are: tobacco use, poor diet and physical activity and alcohol consumption (p.49). The author notes how the science is just barely catching up to the sound counsel the revelation has blessed us with for over a century. She looks at some of the highlights of a book written in 1937 by John and Leah Widtsoe called The Word of Wisdom: A Modern Interpretation, along with a couple of other doctors that recommend a plant-based diet. Overall, it’s got some good stuff, I enjoyed it. This chapter does a good job at addressing many of the concerns that I think anyone who is new to this subject is probably itching to ask. The first is “Why aren’t we taught these things?” If so many experts agree that a whole food, plant-based diet is the best for us then where’s the USDA? Why don’t we hear the benefits of eating this way shouted from the house tops, just think of how many lives we could save! Well, first off, think of how large the cattle and dairy industries are. The government subsidizes these industries, and many of the key players in the government come straight out of the leadership of these very industries. So they do everything to promote milk (got milk? ), the other white meat (Pork!) and beef (it’s what’s for dinner). These things are promoted as perfectly normal and healthy, and the government even made a pyramid to prove it to you. Well, the pyramid is gone and is now a plate, but you get the idea. Even the plate still shows “protein” and “dairy” as essentials to this diet. They don’t even mention what “protein” is, but I’d argue that it’s a veiled way of saying “meat” and I think it erroneously conveys the idea that fruits and vegetables are not sources of protein (they are!). Keep your pyramids and plates, I’ll stick with revelation. She hits on supplements, individual needs and the fallacy of “moderation” which I’ve written about before. Since I eat a plant-based diet, I supplement with vitamin B12 which is really important to do if you go that route. Most Latter-day Saints I know, express a genuine wonder and admiration for the beauty of nature and feel that it should be protected. Yet we turn a blind eye to appalling conditions and horrific abuses that are inflicted upon the animal kingdom to fulfill our desire for their flesh. Now, I don’t go around throwing red paint on people with fur coats but have you ever watched any videos showing the conditions that we raise livestock in? Is that what God intended for animals he created to have joy? With all the plenty that surrounds us do we really need to have the enormous industries built around continual slaughter because we crave and do not need their flesh? Our health is not what drives that industry, it’s profit and greed, pure and simple. All the essential nutrients come from plants anyway, so why do we need to filter them through the bodies of animals when the original sources of that nutrition are readily available? You want the nutrients from corn? Eat some corn, why eat it filtered through a cow that is hopped up on antibiotics and hormones? Is this proper stewardship or have the evils and designs of conspiring men blinded us? The author quotes Lorenzo Snow, “We have no right to slay animals or fowls except from necessity, for they have spirits which may someday rise up and accuse or condemn us” (p.88). Could the health problems associated with over consumption of animal foods be a curse upon us because we have abused our stewardship? I think that’s a fair question to consider. Chapter 9: Why Doesn’t the Church Tell Us These Things? Answer: They do, and it’s already in the scriptures. You don’t hear much pulpit-pounding about it and I think there’s a really good reason for that. First off, the apostles of the church are speaking to a world-wide audience. Every country doesn’t have access to the many food options as, say, Americans. Where plant-based nutrition is scarce, then animal flesh is appropriately used and consumed. Remember, the use of animal flesh is not condemned, but like anything else, some of us abuse the use of it. In my experience, I was heavily influenced by my family traditions, culture and society and didn’t see anything wrong with my lifestyle. There was no outright prohibition on eating meat so I interpreted that to mean that we could just do whatever we wanted! Plus, meat is delicious and who wants some nay sayer ruining deliciousness! feel justified in ignoring the Word of Wisdom because we feel like we need meat or don’t like vegetables, etc. That said, she addresses the flip side by stating, “mandatory meat consumption is also not part of our religion. There is absolutely no prohibition against Latter-day Saints adopting a plant-based diet or enthusiastically encouraging others to do so, though of course it is not our prerogative to command others to abstain from meats.” (p.99) I think that’s perfectly reasonable. She then goes through some great quotes from LDS leaders who have spoken about eating meats in rather plain terms. Think of the significance of the words “promised blessings” for a moment, D&C 89 even outlines them for you. In this chapter those blessings are considered in light of comments made by church leaders. I particularly enjoyed the section titled “Eating as a Sanctifying Experience” which really struck a chord with me. I’m still thinking about the implications of this chapter, and don’t really know where to begin. Have you ever considered eating as a spiritual act or event? You are taking the elements of the earth and contributing them to form what is your mortal tabernacle. What are you using to build your temple? D&C 89 informs us of what God ordained for our constitution and nature, but what do we use instead? Do we build temples out of cardboard and paper mache? This chapter was a nice dessert to the book and offered some wonderful new insights to think about. The book has seven appendixes all with some great information, but the one that impacted me the most was the “Why Go 100%” section. Now, for the last several years I have slowly and incrementally changed my diet. I felt like that was a safe way to go and in many ways it was. We didn’t have all the info and were kind of afraid to just make big moves based on information that might not be correct. After years of searching we found many answers and in Discovering the Word of Wisdom, I found great support for the choices I had made and a clearer vision for where I wanted to go. I have to say that I was sold and I couldn’t see any other way to go other than 100%; why not give it a try and experiment upon the word. 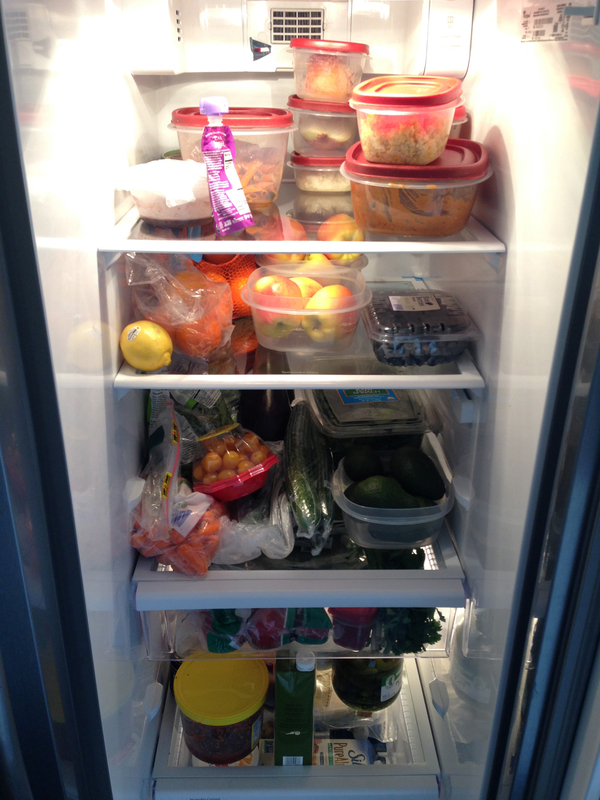 Right after reading the book, I pulled everything out of my fridge, deep cleaned it and did some rearranging. These are my temple construction materials and they should be organized better and consist of what is best! Shelf 4: Bottled goods, salsas, etc. There are several big obstacles to changing your diet. There are old habits and cravings that can be hard to break, family and friends to consider with respect and a whole new world of recipes that may be completely foreign to you! I’ve found tons of great recipes online and by using apps like Yummly. Finding and experimenting with new recipes has been a fun and challenging experience. There’s a peace that comes with trusting the Lord and making sacrifices where necessary to bring your life into accordance with his will. I’ve given up many things, but in return, I have seen the promised blessings fulfilled in my life. This is something that can be very difficult when going down this path. How do we reconcile trying to live the Lord’s teachings when our families and friends (especially LDS) think we are nuts and are on the road to apostasy and extremism (which you can be by taking anything to the extreme). First off, don’t turn into a self-righteous, pompous, food Nazi with your loved ones. We are all on our own paths, so remember that kindness and love outweighs all else. Announcing at dinner time on a family visit that you will not partake of their ‘wicked meal’ is not appropriate and certainly not what Christ would do. Welcome all the Lord’s followers, even those whose faith is weak. Don’t criticize them for having beliefs that are different from yours. Some think it is all right to eat anything, while those whose faith is weak will eat only vegetables. But you should not criticize others for eating or for not eating. After all, God welcomes everyone. What right do you have to criticize someone else’s servants? Only their Lord can decide if they are doing right, and the Lord will make sure that they do right. Some of the Lord’s followers think one day is more important than another. Others think all days are the same. But each of you should make up your own mind. Any followers who count one day more important than another day do it to honor their Lord. And any followers who eat meat give thanks to God, just like the ones who don’t eat meat. Whether we live or die, it must be for God, rather than for ourselves. Whether we live or die, it must be for the Lord. Alive or dead, we still belong to the Lord. This is because Christ died and rose to life, so that he would be the Lord of the dead and of the living. Why do you criticize other followers of the Lord? Why do you look down on them? The day is coming when God will judge all of us. In the Scriptures God says, “I swear by my very life that everyone will kneel down and praise my name!” And so, each of us must give an account to God for what we do. We must stop judging others. We must also make up our minds not to upset anyone’s faith. The Lord Jesus has made it clear to me that God considers all foods fit to eat. But if you think some foods are unfit to eat, then for you they are not fit. If you are hurting others by the foods you eat, you are not guided by love. Don’t let your appetite destroy someone Christ died for. Don’t let your right to eat bring shame to Christ. God’s kingdom isn’t about eating and drinking. It is about pleasing God, about living in peace, and about true happiness. All this comes from the Holy Spirit. If you serve Christ in this way, you will please God and be respected by people. We should try to live at peace and help each other have a strong faith. Don’t let your appetite destroy what God has done. All foods are fit to eat, but it is wrong to cause problems for others by what you eat. It is best not to eat meat or drink wine or do anything else that causes problems for other followers of the Lord. What you believe about these things should be kept between you and God. You are fortunate, if your actions don’t make you have doubts. But if you do have doubts about what you eat, you are going against your beliefs. And you know that is wrong, because anything you do against your beliefs is sin. I draw a line where God has set a strict prohibition. If you politely refuse alcohol, tobacco, coffee or tea, I think people are generally understanding and respect that. Where it gets difficult is around people who follow the same religious tenets. If you practice a shared principle differently than them, the impression is left that one way is right and the other is wrong. So they may either feel condemned by you or assume that you are the apostate. I believe that there is room to show mercy and understanding. If you are running around being a food Nazi and condemning people, you are probably missing the mark. So when I go out to eat with family, I simply order what I want to eat and things are fine, that is my preference. If I am served a meal at their home, I eat what I am served out of respect because my family is more important to me than food. It’s a fine balance and it takes more humility than anything and more importantly, those you love will feel like you value them more than a plate of food. Remember that persuasion versus force is the Lord’s way. “If I esteem mankind to be in error, shall I bear them down? No. I will lift them up, and in their own way too, if I cannot persuade them my way is better; and I will not seek to compel any man to believe as I do, only by the force of reasoning, for truth will cut its own way.” History of the Church, 5:498–99; from a discourse given by Joseph Smith on July 9, 1843, in Nauvoo, Illinois; reported by Willard Richards; see also appendix, page 562, item 3. The book doesn’t give you all the answers but that isn’t the point, the point is to consider doctrine and principles in a fresh light with a challenge to put them to the test. Why not give it a shot, see what happens, follow the Spirit and consider what you learn through it all? Alma taught us how to conduct our experiments on the word and how to know what is good or not. I use this pattern constantly throughout my life and the beauty of it is that if something just doesn’t work for you, cast it aside. If it enlarges your soul, enlightens your understanding and becomes delicious to you, then all the better! I found Discovering the Word of Wisdom very delicious indeed. Have you read the book? What were your big takeaways? What are some impressions you have about the Word of Wisdom and how you practice it? How do you find peace with family and friends who have different views on how you choose to live the Word of Wisdom? I admire your devotion and desire to do what’s right, even when it’s hard. Might I add a few insights a friend shared with me on the topic, if you don’t mind my going off for a bit? A lot of people read D&C 89:12 and use it to justify their personal bias. It’s obviously an important scripture, but it isn’t the only time the Lord has counselled us on this issue. D&C 49:18 says, “And whoso forbiddeth to abstain from meats, that man should not eat the same, is not ordained of God.” (Yes, there’s a weird double negative in there, which, ironically the Spanish version removes and makes it more clear.) Basically it’s saying that those who forbid to eat meats aren’t ordained of God. That’s pretty strong wording. He goes on to say that animals are made for man to live in abundance (the opposite of which, I guess, would be stinginess). Well, now I’ve just pushed my view on you. I obviously feel really strongly about it. I don’t mean to cause a fight. Just sharing some insights that my friend shared with me. I found them very eye-opening, and I hope you do too. I really respect the work on this blog and wish you continued success. Hi Skinny, fear not, all perspectives are welcome here as we each seek to work our way through life and understanding. You are welcome to share your perspective and views on any subject without fear of condemnation. It is not for me to tell anyone HOW to live a principle of the gospel. My purpose is to explore what the principles mean along with ways I have found to apply them myself. What the Spirit compels you to do with that knowledge is between you and the Lord. I understand your concern about “forbidding the eating of meats” and I agree, I don’t practice the forbidding of eating meats because it is not in accordance with God’s desires. For example, last night I purchased a Cafe Rio salad with pork on it for my wife because she wanted it, while I had a veggie burrito. I teach my family the principles, but they decide for themselves. I allow my children to order food with meat or to eat meat when it is served to them because I believe that it should not be expressly forbidden. You are also correct that many people will use just one section of scripture or one verse to justify their personal bias. All of the scriptures concerning the subject must be explored, along with counsel of authorized servants of the Lord in our day. There were rules for the shedding of blood and the use of flesh. Taking D&C 49 with Genesis and D&C 89 is sufficient enough to show that the Lord intends us to use animal flesh for food, but only when there is an express need for it. This is in line with 1 Timothy as well, because nobody is forbidding the eating of meats, if they are, then they are in error. This is not forbidding the eating of meat, but a respect for the proper stewardship of God’s creation according to our needs. All three of the scriptural examples mentioned and a large sampling of quotes from latter-day apostles consistently associate the use of flesh wherever a genuine need is present. In D&C 89, the Lord even goes so far to say that it is “it is pleasing unto me that they should not be used” but then gives the conditions in which they can be if necessary. Today, flesh is largely consumed by most Americans and Mormons is done so without any regard for need; I don’t think that’s really even debatable. Some go to extremes by forbidding the use of meat and I think we both agree that this is wrong. While others are just extremists in the opposite direction, removing all barriers to the use of flesh. I would suggest that the scriptures condemn both extremes and teach a stewardship that respects the appropriate use of life in a way that is pleasing to the Lord. I appreciate you taking the time to comment here. I think your insight adds to the discussion and I will look into the references you have shared and encourage others to do the same. We should be willing to be open to all information and allow the Spirit to guide our actions. Just wanted to say I love Cafe Rio. Richard, you are a hoot. Really appreciated your added insight on this subject. Our family now follows a 90% whole grains, fruits, vegetables diet with 5% animal protein diet (meat, eggs and dairy and only the best quality) and 5% (sugar and other) mainly so that when we are invited at others we can eat what they serve. I have not used white flour, nor white sugar for years and limited meat only in winter. We feel great physically–are rarely sick–and feel really good about our balance of what we are taking in to our bodies. The meat controversy is not a complicated issue. Sparingly means exactly what it means. No more, no less. It doesn’t mean avoid(D&C 49). It means, “an essential PART of a healthy diet.” The Word of Wisdom does not necessarily mean plant based diet. That’s the letter of the law. It’s actually a guideline for us because of the hearts of “conspiring men in the last days.” It means wholesome food used with prudence and thanksgiving. That’s the spirit of the law. “This is my answer to you in relation to President Brigham Young’s statement that mothers should not feed their small children meat. Yes! Small children do not need the flesh of animals. May I add also that adults would be better if they would refrain from too much eating of meat. As far as I am concerned the eating of meat should be very sparingly. In fact I will be contented if the Millennium was to be ushered in next week. When it is, we will learn that the eating of meat is not good for us. Why do we feel that we do not have a square meal unless it is based largely on meat. Let the dumb animals live. They enjoy life as well as we do. If you look at what church presidents have said on the matter, you will find very consistent views in earlier church history. In the past, it was very much necessary to support life by hunting where times of famine and cold made the use of animal flesh for food a necessity indeed. In fact there are many places in the world today where this is still a need. President Smith is laying some additional perspective down on the principle here. He asks the question, “…with so many fruits of the soil and from the trees of the earth, why cannot man be content?” When the Word of Wisdom was revealed, there was no refrigeration, central heating, a massive economic system where virtually any food can be obtained from a local store at any time of year. I believe that the advances we have made further open the opportunity to survive and flourish without the need to eating animal flesh. I’ve done so for several years and I am very healthy. I’ve done this as an experiment since 2011 and since then I’ve lost 40 lbs, my blood work looks amazing, and my cholesterol levels are right about perfect. It’s been truly a testament to me of the wisdom of the Lord. I eat a very rich diet of many delicious plant-based meals and occasionally eggs and cheese. If I am a guest at a home where meat is the primary dish and I can avoid eating it without offending the host, then I will, but if I feel that avoiding it would cause contention then I will eat some with thanksgiving for the sake of showing respect to my host. I feel that in doing so, I eat it so sparingly anyway that I am in keeping with the spirit of the law. Based on a story from church history, I personally feel that it is also appropriate to eat meat for the sake of not letting animal flesh go to waste. While I still wrestle with this one, I think that too may constitute a need because letting it go to waste would not be showing thanksgiving. The main problem I see is that meat is consumed by many Latter-day Saints in a manner that is nowhere even close to “sparing” which means “rarely.” Meat is eaten in heavy amounts in virtually every single meal, so what is sparing about that? It isn’t used “only in times of winter or famine” we have an entire industry of millions of animals slaughtered in assembly lines to satisfy our craving for their flesh. Is that done in the spirit of thanksgiving? You cannot look at the modern industry of slaughter and compare that to how animals were raised in Joseph Smith’s day. There is a huge disconnect and before we even begin to debate the definition of “sparingly” we need to look at the bigger picture of how we view and treat animal life as a whole. What I am saying here is based on taking an honest look at the situation and after much research and prayer. I was not raised a hippie in California, I grew up in South Texas where every Sunday the air filled with the smell of mesquite and BBQ. I live in right in the middle of Texas now! Trust me when I say that this perspective did not come easy to me in the least bit, it scared me tremendously as I began to research it and consider the changes I would need to make. I saw a little clearer through the Lord’s eyes and my heart changed. I don’t claim to understand everything about this issue. I don’t speak for anyone but myself and please note that you are commenting on my personal study blog where I share what I happen to be studying at any given time. My views change as further light sheds forth. I allow comments for people to share their own insights, but I have no desire to argue or contend over doctrine, principles, or personal applications. If someone feels differently, I respect that, we are all in different situations and must apply principles based on our own needs and according to the light available to each of us.